Summary: In the book Giraffes Can't Dance, Giles Andrede tells a story about Gerald the giraffe and how he loves to dance except he isn't very good at it. His legs were too crooked and his legs were mighty thin. At the Jungle dance all the animals were dancing a variety of different dances and they could really move. 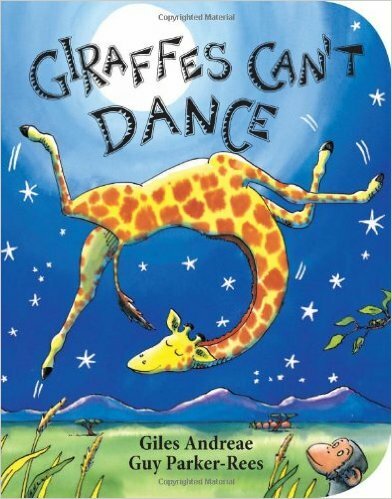 When Gerald decided to try it out all the jungle animals made fun of him saying "Giraffes can't dance!" But there was one little cricket who had all the confidence in Gerald if he just tried a different song. Gerald finally found his footing at the Jungle dance and all the animals were amazed and asked for lessons of their own. Element #2 Respect for others: The jungle animals showed a great deal of respect for Gerald when they saw him dance on his own even though they were convinced Giraffes couldn't dance at all. When Gerald first tried to dance he simply could not do it and walk away from the dance floor feeling very sad. Once the cricket talked him into trying a different song Gerald got up and tried again. To his surprise the animals did not laugh, this time they were amazed by Gerald's dance moves and asked him how he learned to dance like that. The animals gave Gerald a second chance and they really came to respect Gerald and his bravery. Activity: For the activity I would put together a class talent show and encourage everyone to participate. Students will learn how to show respect for others and their talents when they see that everyone is different. Not all talents will be the same and for that reason every performer will receive a round of applause after the act feeling well respected by their peers. Respect is something everyone deserves, especially your friends in class.